Vacuum Feedthroughs, What are they? Definition: An assembly which has as its main purpose, the pass-through of substances or energy from outside of a hermetically-sealed vacuum chamber to the inside. A vacuum feedthrough must remain leak-free under high and ultra-high vacuum. 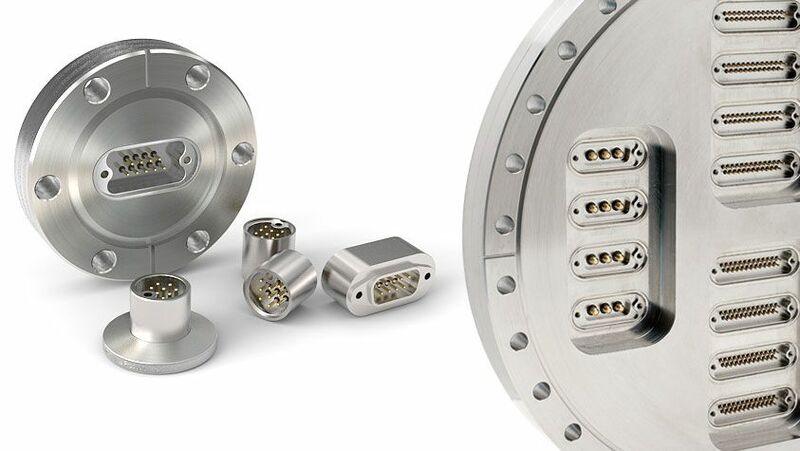 In scientific and industrial vacuum communities, the terms Vacuum Feedthrough, Electrical Feedthrough, Ceramic Feedthrough, Glass Feedthrough, and Hermetic Feedthrough are often used interchangeably with no regard to their subtle differences, which is OK. However, you might ask yourself “what is the real difference between these terms?” The terms Hermetic Feedthrough and Vacuum Feedthrough are virtually identical when used to describe a feedthrough for use on a vacuum chamber; both must be leak-tight. Electrical feedthroughs can be manufactured using Ceramic or Glass, which is where the other terms come from. There are many types/styles of vacuum feedthroughs, and manufactured using various techniques. 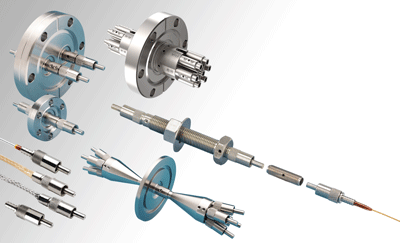 – A vacuum feedthrough in which the primary design/function is to carry electrical energy into a vacuum system. Single and Multi-pin designs are routinely manufactured. Glass to Metal (Good) – crystalline amorphous properties of the glass promotes low loss signal transmissions. Matched seal: derives its strength from bond between the glass and the metal's oxide. The glass and the metal have roughly the same coefficient of thermal expansion. Compression seal: produced when the glass and metal have different coefficients of thermal expansion, and where the metal compresses around the solidified glass as it cools. Compression seals can withstand very high pressure and are used in a variety of industrial applications. Glass-Ceramic to Metal (BEST) – seals are the optimal choice for vacuum feedthroughs as they combine the benefits of a compression seal, low signal loss, and superior performance in high stress environments. Epoxy (Poor) – seals are very economical but have many limitations including outgassing issues and generally limited to 100 degrees C operating temperature. Glue or Rubber (Poor) – seals are also economical, but have the same limitations as Epoxy, but to greater extremes. 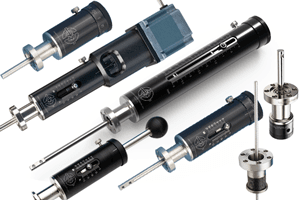 – A vacuum feedthrough in which the primary design/function is to carry liquid or gas in and out of a vacuum system. The seals for this type of vacuum feedthrough include metal to metal swaging or deformable metal gaskets. – A vacuum feedthrough in which the primary design/function is to transfer motion (Kinetic energy) into a vacuum system via mechanical means. Bellows sealed (BEST) – usually welded bellows assemblies in rotary and linear type feedthroughs. Manufactured using 316 stainless steel, these types of feedthroughs are generally rated for 250 degrees C, no outgassing, and rated for ultra-high vacuum environments. O-Ring (Good) – typically made from Viton, Buna-N, or Kalrez compounds. O-rings have a shorter life span than bellows. O-ring sealed vacuum feedthroughs are generally rated to 80-150 degrees C and only used for high vacuum applications. Ferrofluid (Expensive) – A unique rotary interface is filled with a ferromagnetic fluid suspended in place by the magnetic field of a permanent magnet to produce a hermetic vacuum seal. – A vacuum feedthrough in which the primary design/function is to transfer emitted light through a fiber optic cable assembly into a vacuum system. Glass to Metal Buffer sealed (BEST) – uses a glass-ceramic compression (discussed above) sealing technique to make the seal between the fiber and the metal. Rated to 250 degrees C and good for ultra-high vacuum applications. Epoxy sealed (Poor) – seals are economical but have many limitations including outgassing issues and generally limited to 100 degrees C operating temperature. – A vacuum feedthrough in which the primary design/function is visual, optical or broad-band energy transmission in and out of vacuum systems. Brazed seal – Vacuum viewports are hermetically sealed to a metal using various high temperature braze alloys. Brazing is performed inside a vacuum or controlled atmosphere furnace. The joining of Sapphire or Quartz, discs to metal is accomplished by first producing a metalized surface on the crystalline /amorphous substrate — thereafter the brazing process is simply bonding two metal surfaces. 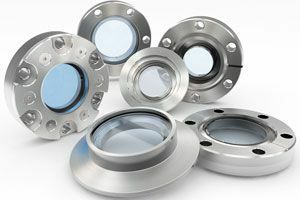 Sapphire Viewports are sealed using a gold bearing alloy, and suitable for temperatures as high as 450C, but only available in small diameter sizes. On the other hand, Quartz and fused silica require a softer (ductile) lead-silver alloy, with a maximum 200C service temperature.